Mayor Libby Schaaf’s 384-page proposed budget includes a subtle but potentially significant change to the structure of Oakland’s city government: the creation of a Department of Transportation (DOT). It turns out Oakland has never, in its 162-year history, had a department dedicated to transportation. This omission is long overdue for correction, which needs to occur soon, and could happen with little cost to Oaklanders. The answer is a combination of having both a lot of old infrastructure and a handful of very resourceful city staff. But neither of these approaches is sustainable, and our growing city in the middle of the growing Bay Area needs to be allowed to do more. If this part of the mayor’s proposal survives and makes it into the actual 2015-17 budget, the future DOT would primarily draw staff and responsibilities from two other departments: Public Works and Planning. For a small demonstration of what these departments do, and why their imperfect overlap creates debilitating friction, let’s go back to 2011. Parklets (tiny, permitted, micro-parks that convert parking spaces to seating for people) were still a relatively new idea, and a few small business owners in Oakland wanted to build their own. These business owners contacted Walk Oakland Bike Oakland, where I, as an intern, reached out to the City of Oakland. A senior person in the Department of Planning told me parklets were the responsibility of Public Works, which governed the streets. A senior person in Public Works told me they should be up to Planning, because only Planning issued permits. As a pushy freelance writer, I put both of these on-record quotes in a draft article and sent them back to their owners. Fortunately, their mutual director responded lightning-quick by creating a cross-department task force, which did create a pathway to permitted parklets in Oakland. The rewritten article is a nice tribute to collaboration under pressure. Parklets are nice ornamentation, but not nearly as essential to a city’s public health, equity, or economic success as transit, bridges, and any major development project. If the city’s internal bureaucracy couldn’t allow something as basic as a planter in the street, how likely is it that a new stadium area would be pleasant to bike, walk, or ride transit? Departments of Transportation set a local vision for transportation because they have the bureaucratic clarity and power to do so. 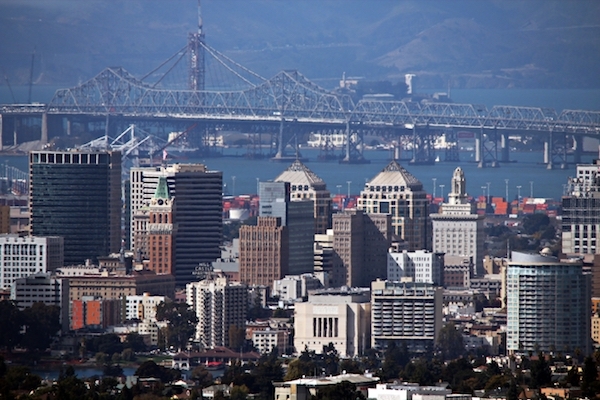 Oakland’s Public Works is focused on maintaining existing infrastructure. This is important work, but Oakland needs new transportation projects if it wants to avoid being mired in automobile congestion forever. To attract a truly innovative transportation leader, Oakland needs to create a department director position that is empowered to lead transportation improvements. A new DOT would mark this urgently needed shift from maintaining roads for cars to building streets for people. Departments of Transportation are also responsible for implementing their city’s transportation vision. Not just interns have trouble finding someone to talk to about transportation in Oakland. Oakland’s transit agency partners don’t have clear points of contact within our city, delaying simple improvements like relocating bus stops and complicating larger capital projects like International BRT. Some staff have learned how to overcome this system, but what it we created a DOT to designate and authorize specific staff to represent Oakland in interagency efforts. Like our neighboring cities, Oakland’s DOT would bring in much more money than it spends from local funds, leveraging our scant dollars to build the infrastructure we need. To realize the transportation future Oakland needs, we should support Mayor Schaaf’s proposal for a Department of Transportation. If you’d like to learn more, consider attending a Community Budget Forum, taking the mayor’s budget survey, or attending the Budget Adoption Meeting Thursday, June 27th at 6:30pm in City Hall. Oakland is ready to start laying the groundwork for its next 162 years of transportation today. Kudos Libby! Making common sense more common in Oakland!